Heroin addiction can be one of the most harrowing addictions to have, and even more so harrowing when trying to stop using the drug. This is especially true for chronic, long-term heroin addicts. Trying to break an addiction after months of heroin abuse can realistically take years to accomplish. First developed in the 1960s, methadone maintenance treatment has remained the standard against which other opiate addiction treatment approaches are measured. As an opiate addiction treatment medication, methadone offers recovering addicts much needed reprieve from persistent drug cravings and other residual withdrawal effects left behind by heroin addiction. In effect, methadone maintenance treatment is known as the “treatment of last resort” for people who’ve had little to no success with other treatment approaches. Heroin belongs to the opiate class of drugs, best known for their pain-relieving properties. Opiates, as a group, also carry a high potential for abuse and addiction. Heroin, in particular, exerts a tremendous strain on the brain’s regulatory function through its ability to alter neurotransmitter secretion rates. Over time, these effects compromise the brain’s functional capacity to the point where it becomes completely dependent on heroin’s effects to function. Support group work is an effective behavioral therapy used in MMT. Long-time addicts who enter heroin addiction recovery are left to contend with rampant chemical imbalances that work against their efforts to abstain from drug use. In the absence of the drug, a person stands to experience severe withdrawal effects and intense drug cravings on an ongoing basis. Call our helpline at 800-683-3270 to see if your insurance will help pay your rehab costs. Methadone’s role as a medication therapy works to replace heroin’s effects in the brain and restore a normal chemical balance, according to National Institute on Drug Abuse. Methadone also belongs to the opiate drug class, but carries a considerably lower risk of abuse and addiction than heroin. In effect, methadone interacts with the same neurotransmitter-producing cells as heroin. Over the course of a developing heroin addiction, these cells undergo considerable damage, weakening their ability to produce needed neurotransmitter supplies. Methadone’s effects support damaged cell functions and in the process provides much needed relief from withdrawal effects and drug cravings. Methadone maintenance treatment also addresses the psychological aftereffects of heroin addiction through ongoing behavioral treatment interventions. Unlike physical withdrawal, the psychological effects of addiction can persist long after a person stops using the drug. According to Journal of Dialogues in Clinical Neuroscience, behavioral treatment works to retrain the way the brain thinks, which ultimately helps to eliminate compulsive drug-using behaviors over time. 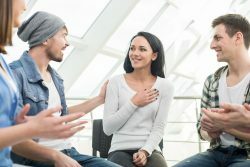 While methadone’s effects work wonders at reducing withdrawal and cravings effects, treating addiction’s psychological component is essential to helping recovering addicts take back control of their lives from compulsive drug-using behaviors. In the absence of needed treatment support, heroin addiction can become a lifelong condition. Methadone maintenance treatment provides needed support for damaged brain functions while equipping those in recovery with the skills needed to cope with everyday life on a drug-free basis. If you or someone you know are considering methadone maintenance treatment and need help finding a program that meets your needs, please feel free to call our toll-free helpline at 800-683-3270 to speak with one of our addictions specialists.